My intention was to get this post out sooner, but the siren call of procrastination beckoned… This is my first update for the Genius Project — my attempt to spend 10,000 hours developing as a playwright. The breakdown of how my time was spent gives a clearer idea of my deliberate practice. Only a third of that time was spent on actual writing. 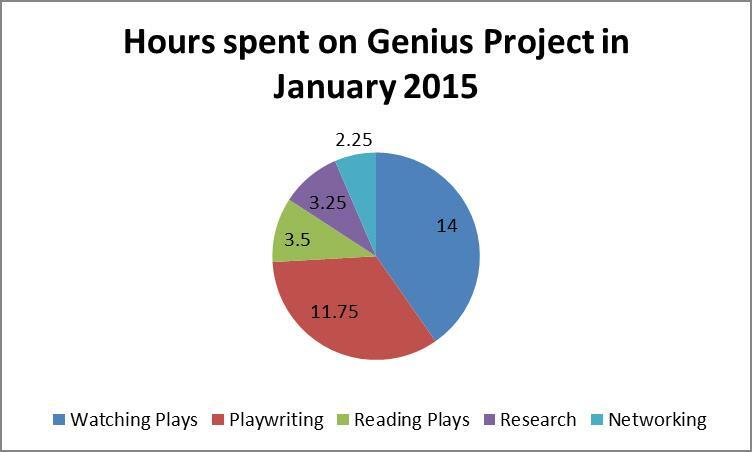 The bulk of the time was spent on watching plays and reading plays. And some of that time was spent talking with other writers and getting or giving inspiration. Below is a chart with the actual breakdown of hours spent on each item. Although writing is the most important part of developing as a writer, it is crucial to see and read other people’s work. It can inspire you to push yourself further or goad you into doing better. There are so many stories out there. I learned two things from my first month of the Genius Project. The first thing is to start the work as early in the day as possible. I find it very hard to get started on creative things later in the day. The second thing I learned was that it is very important to find things to inspire myself. Writing is such a Sisyphean activity and it is easy to talk yourself out of it before even getting started. Having plays to read or inspirational quotes or even inspirational friends to talk to can help keep up the motivation to face that dreaded blank page or empty screen. This is just the beginning of my journey and I expect it to take a little while for me to develop the habits to keep me chugging along at a sustainable pace. The important thing is to keep at it and to keep seeing what works and what doesn’t work.